With Women’s History Month as our inspiration, we are highlighting women authors/illustrators who create kids books about the world’s faith traditions. Today, we’re focusing on Judaism. For our related post about kids books on Islam, click here. And for our post about kids books on Buddhism, click here. There are SO many kids books about Judaism out there, and the vast majority of them are authored and illustrated by women. There are literally dozens of books for every major Jewish holy day — Rosh Hashanah, Yom Kippur, Sukkot, Purim, Passover, and Shavuot. However, there are a couple of series that we (and the kids) particularly enjoy. 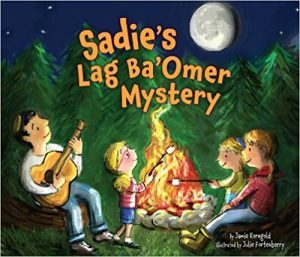 This series features Sadie, and sometimes her sibling, Ori, as they learn about various Jewish holidays. 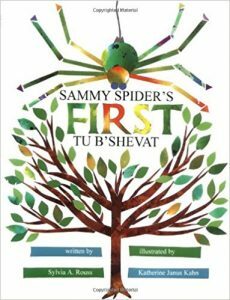 The series is geared toward kids in preschool through lower elementary school and includes books on Passover, Hanukkah, and Sukkot, but books about the lesser known holidays of Lag Ba’Omer and Tu B’Shevat are also included. All the books provide factual information about each holiday and share typical ways of celebrating. And Korngold, a Reform rabbi who lives in Boulder, CO, definitely knows how to be true to her faith without being preachy. Known as the Adventure Rabbi, she celebrates most Jewish holidays outdoors, leading hiking, skiing and other adventure-based trips. 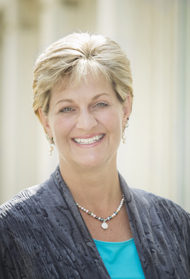 She was also listed as one of America’s most inspiring rabbis by Forward magazine in 2014. Julie Fortenberry also does a great job with colorful, charming illustrations. Rouss and Kahn have been writing Sammy Spider books for almost 25 years. Like the Sadie series, these books are intended for kids in preschool through the lower elementary years. The series includes books on most of the major Jewish holidays: Rosh Hashanah, Yom Kippur, Sukkot, Purim, Passover, and Shavuot. But it also includes books on Tu B’Shevat and Simchat Torah, as well as other aspects of Jewish life — like Shabbat preparations, attending a bar mitzvah, visiting Israel, and the mitzvah of caring for the sick. Most recently, Rouss and Kahn have published books that teach colors (Sammy Spider’s Hanukkah Colors) and shapes (Sammy Spider’s Passover Shapes). The vibrant illustrations are very different than those found in the Sadie series as Kahn uses a cut-paper style that is similar to the artwork seen in Eric Carle’s books. Numerous coloring books, sticker books, and activity books are also available in the Jewish tradition. Many of them focus on Rosh Hashanah, Hanukkah, and Passover. One of our favorites is Hanukkah Mad Libs (Mad Libs, 2012) for kids in the upper elementary and middle school years. 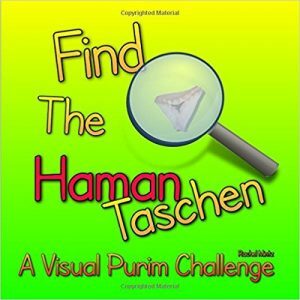 We also really love Find the Hamantaschen: A Visual Purim Challenge by Rachel Mintz (2017). Like the Where’s Waldo? series, this book contains illustrations with various Purim-related objects hidden within them. Kids can try to spot Purim masks, graggers, and other items while listening to the reading of the Megillah! Like the other major world religions, many options are available if you’re interested in exposing your kids to Jewish holidays and cultural practices. You just have to be willing to explore along with them. Stay tuned for our post tomorrow on Hindu books for kids by women authors/illustrators!